On our calendar you find the dates for our trekking, mountaineering and guided trips by the mountain guides of our Alpine School Arco. 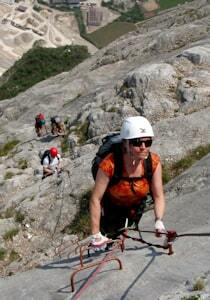 You will also find the dates or the courses at Lake Garda Dolomites Italy. A very special via ferrata of its own kind: situated in a canyon which used to be a secret escape path from the above located Drena Castle. The holes of the old wooden buildings are still visible. The route itself is not very long but on a short passage some arm strength is requested. The course is only slightly above the bottom of the canyon. After ca. 50 m there is an emergency exit. Otherwise you just follow the iron rope and the iron steps. At the end of the route there is a swinging iron bridge on which you may exercise your balance. A final steep path is leading to Drena Castle. Alpine and very panoramic route with view over the entire Lake Garda, Monte Baldo mountain chain, Sarca Valley and the Brenta Dolomites. 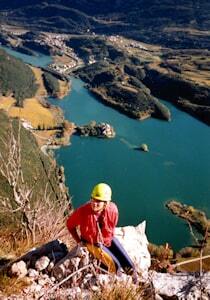 Fairly easy via ferrata with short rock climbing passages and exposed paths crossing vertical walls. Throughout the entire route you may admire the remainders of military war construction owing to which the via ferrata has been presumably built. The iron ropes have been partially renewed and are in a good condition. For the descent we follow the same direction to Sentiero M. Foletti, then follow the way signs. You can enjoy the unique view over Lake Garda on the long and exposed iron ladders. The "Friendship Route" with the two famous and never-ending ladders is technically not very difficult but you must absolutely not suffer from vertigo. It offers unforgettable and breathtaking views into the depth of Lake Garda and its valleys. The path leads you over partially equipped rock terrain, always steep but never difficult up to the first ladder which has more the 100 rungs. On a small platform in the middle you can take a rest and then follow vertically up. 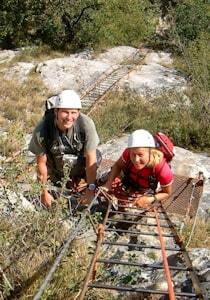 Further up over unsteady terrain and some iron steps we reach the second ladder which is vertical and about 70 m high. We reach SAT Peak after we have crossed some well equipped rocks and several short ladders and iron steps, we reach Cima SAT Peak on the top of which there is an iron flag and a breathtaking view over the entire Lake Garda. 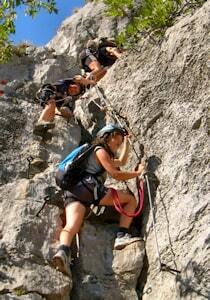 Via ferrata on the walls of the Adige Valley following antique smuggler' s trails in the Dolomites rocks. Considering the enormous length of the route, a very good physical condition is a prerequisite. In the beginning there is a short ladder, then crossing some rocks up to a very exposed ledge with many a hundred of meters below you. Following the ledge around the left ridge, we are crossing the huge and impressing cave on a sometimes rather narrow path which is getting wider towards the final part. On the path crossing the cave there is no iron cable for belay. Further upwards crossing forest, partially equipped rocks and open terrain we finally reach the top. A never-ending long trip on an immense and historical wall. Technically average difficulty. Due to the length of the trip, a very good physical condition is a prerequisite. The trail is evading the steep passages and takes advantage of the weaker parts of the wall until you finally reach the impressing horizontal ledge which forms the upper limit of the light-grey limestone slab. Then to the left over some iron steps almost vertically onto the exposed main section of the via ferrata. The following passage is less steep, some without signs to the green "Cengia del Maurizio" (1200 m.) where you find the summit' s booklet. The first part up to Doss dei Pini has been renewed in 2005 and has thus become slightly more difficult. The panorama and view of Monte Casale Peak Casale (1600 m), in the North the Brenta Dolomites, in the West the Adamello Glacier and in the East the triangular peak of Marmolada, makes up for the fatigue. Very close to Mori village. This route is an ideal exercise for difficult vie ferrate. There are very exposed crossings and difficult vertical climbing passages. Over vertical and overhanging parts and several crossings up to the easier middle section. The end of the via ferrata is reached after a very steep 60 m climb. The Via Attrezzata Monte Albano "Ottorino Marangoni" is one of the first sports vie ferrate in the Trentino Dolomites and is being considered a very demanding route in the Alps. It has lost none of its popularity which is obvious when you see the polished rock on the entire route. This route is not recommended with rainy weather and wet rock. Via ferrata only for experts; one of the most difficult vie ferrate in Europe; the first 60 m and the central slabs are very demanding. It offers a unique panorama over the entire Sarca valley and its various lakes, from Lake Toblino to Lake Garda. It is the most sportive and the most demanding route in the Lake Garda Dolomites region. You must cross a 30 m wall with almost no footholds, equipped only with iron ropes. Who has problems managing the initial part, should take the emergency exit which is leading to the right and is equipped with iron ropes. Only at the end the wall is sloping and the major difficulties are over. Then you proceed to the exit at 950 m and you have reached the top of Piccolo Dain Peak.